Yeah, yeah, yeah....I know doors have been done a million times before. But who can resist taking a shot of a really interesting doorway? 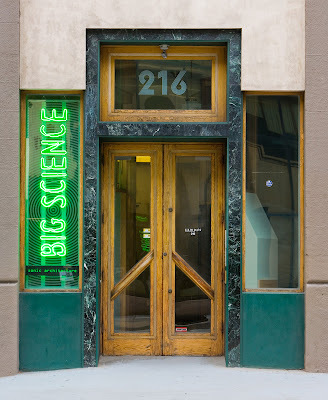 The small green lettering under "Big Science", which is quite sharp but just too small to show up in these Blogger picture sizes, says "Sonic Architecture". So, if you need Sonic Architecture...."who 'ya gonna call?" I could just see Bill Murray and Dan Aykroyd coming out of there like in "Ghostbusters".